The main contractor behind plans to electrify the railway line between Preston and Blackpool has pulled out. Balfour Beatty confirmed it was leaving the scheme after a review said the work was unlikely to be on time and budget. Network Rail insisted the electrification was still due to finish by spring 2017 and a new contractor would be "appointed shortly". 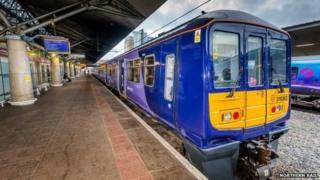 "By mutual agreement Balfour Beatty will be leaving the partnership delivery of North West electrification. "This is the appropriate time following the completion of phase two between Manchester, Liverpool and Wigan. "We will be retaining Balfour Beatty's design services and a new contractor will be appointed shortly." "The Blackpool to Preston line has already been delayed once. "We do not know whether the rest of Lancashire will be affected in the way the Transpennine electrification has been affected, which is an indefinite postponement." In June, it was announced the government would delay or cut back several modernisation projects planned for Network Rail due to rising costs and missed targets. A Department for Transport spokesperson said: "We are fully committed to the North West electrification programme as part of our ambitious plans for the Northern Powerhouse. "We are clear that we expect Network Rail to deliver electrification to Blackpool as planned so that passengers can benefit as soon as possible. It is for Network Rail to manage its relationship with contractors as necessary."